This option is the complete package. We will pick you up at the airport, and bring you to a 4 star hotel centrally located in Beijing. Then your epic hike will begin. In addition to the Gubeikou-Jinshanling-Simatai tour, which has the best of both Great Wall worlds, this tour also combines the natural wonder of Black Dragon Pool (the best waterfall in northern China), mountains, as well as the ability to explore local villages and townships. The Jiankou to Mutianyu hike is a joy to hike with its dramatic ruins, and is good for some excellent photographs. This tour will add to your knowledge of the Great Wall, as you will gain a greater understanding of the wall’s architecture, military purpose, and structure. This hike is of course a long and sometimes challenging one (at 80km/50 miles for the 10 day total), so you should be in good physical condition. 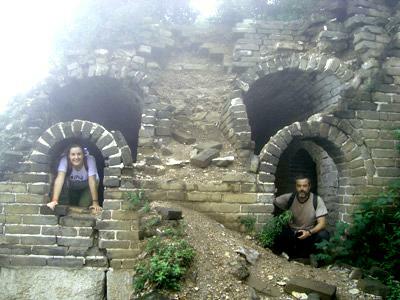 At the end of your tour you will have the option of going with us to some of the best sights in Beijing and all of China. If you’d like you have the option of going to the Forbidden City, Temple of heaven, the Summer Palace, the Lhama Temple, or if the hike has worn you out, you can go on a breezy and relaxing rickshaw tour of Beijing hutongs. At the end of your stay, your hard work on your hike will pay off as you will get to enjoy a nice Chinese dinner. Please join us for a hike that will show you the best of the Great Wall from Beijing all the way to the Yellow Sea!